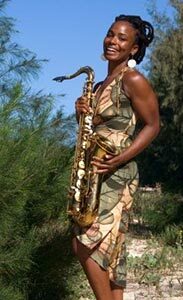 Joie Taylor has been a saxophonist for over 25 years, and has been a member and leader of several bands. In the Montgomery Jazz Orchestra of the State of Alabama she has performed in small and big bands with Tommy Stewart, Charles Ellington, Kebbi Williams and grammy award winning artists Javon Jackson and Delfayo Marsalis in the 2016 Maui Jazz Festival. As a member of the world famous Clark Atlanta University Jazz Orchestra begun by Dizzy Gillespie, she has toured Europe as part of the Montreux, Paris, and North Sea Jazz festivals. She can be heard on the released album by Mausiki Scales and the Common Ground. On Maui was a member of Rio Ritmo and currently plays as a solo artist at various locations. She sang as lead vocalist in the group One & One. Her styles include: meditation, jazz, neo-­‐soul, electronic/dance, and lounge including original compositions.